Melbourne Cup-winning jockey Kerrin McEvoy will join the Australian riding invasion for New Zealand’s richest race. The Darley operation’s stable hoop has been booked to partner Massale in this Sunday’s Karaka Million with Noel Callow already confirmed for the Danica Guy-trained Dragon Lair and Tommy Berry will partner Way In for Shaune Ritchie. McEvoy won the cup at Flemington in 2000 aboard Brew, who was prepared by Michael Moroney and the Melbourne-based New Zealander now operates his Matamata stable with Chad Ormsby. Massale will be one of two runners for them in the juvenile feature. “I’ve known Kerrin since I rode against him in Australia and I saw him in Melbourne over cup time last year and said you’ll have to come over and ride one for us,” Ormsby said. He won on debut at Awapuni before he finished fifth at Ellerslie in his only other appearance. 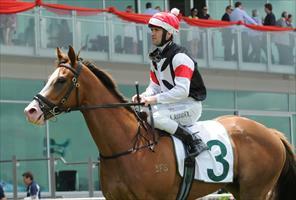 “He’s a laid-back horse who doesn’t need a lot of work and he’s ready to go,” Ormsby said. Their other Karaka Million runner Divissima will be ridden by Kiwi international star James McDonald. “We’ve put James on to give him a chance to ride her with a view to getting her to Australia,” Ormsby said. Divissima was a debut winner at Paeroa and her place in the Karaka Million line-up has accentuated the highs and lows of racing. The Ballymore Ladies’ Syndicate No.1 shares in her ownership and they tragically lost another promising filly Xquisit after she fractured a pastern at Pukekohe in November and had to be put down. – NZ Racing Desk.